Greetings everyone. I'm going to toss my hat in the ring to see what you think about my intermittent restricted performance issue. A little background first to help everyone with your thoughts. In 2008 I bought a 2003 XJR with 55,000 miles. Today she has 229,449 fun-filled miles under her chassis. About a month ago I started getting an intermittent restricted performance code. Here's what I've done to be an active participant in my own rescue. - Cleaned the K&N air filter. Now understand I have never had an issue before. I clean and recharge the filler twice a year. - Cleaned the MAF sensor. - Replaced the hose from the valve cover to the air plenum for the air cleaner and throttle body. - Cleaned the throttle body itself. - Checked for air leaks from the air filter to the throttle body..
- Checked for any loose wires on the mass airflow sensor and those wires on the throttle body assembly. - Cleaned all electrical connectors. I have borrowed a code reader. Fairly upscale unit at that. When I plugged it in, it lit up like a Christmas tree. It said it can be an O2 sensor, knock sensor, throttle body electrical thingies. It didn't point to a specific silver bullet that would solve this intermittent RP issue. I also own a 2004 Range Rover HSE full-size so my mechanic and I have become very close personal friends, to say the least. I always laugh and say I am funding his early retirement plan. I gave him a call and discussed everything I have done. I also informed him I do have a minor valve cover leak on the driver's side. Nothing hateful but there is some oil leaking on the cover, by the firewall. I had him replace the gaskets at about 65,000 miles. So to say the least, I've had a very good run on that repair. He said based on everything I've done he feels it is that valve cover gasket. Last edited by XJRfan; 01-30-2019 at 08:15 AM. Reason: Posted in wrong forum. Please delete. Could you please tell us what codes you get? Sorry guys for not listing the Fault Codes in the body of my original post. John, thanks for letting me know I missed posting these. It's going to be very unhappy (as you find it is) with even a few of those. I'd check the battery (and power cabling) isn't the cause and then check circuits (fuses, relays, etc) for the 2 HO2S (upstream) sensors. Ho2S sensors are a wear item but still they don't fail together without a specific reason (and it's rare). I just ran out and checked the battery cabling. All proper snug and secure, clean and tight. The RP code started last summer but because it was so intermittent it has been ignored. Well not totally ignored, I just hadn't taken the energy to do more other than what I listed in my original post. Naturally the other codes I couldn't see until I borrowed the code reader. Nothing was showing on my dash except the RP code. still open for more conversation before I take it to my mechanic. And speaking of O2 sensors where are they located on the motor? I'm sure that's something I can replace myself? Knock sensors, that's a whole other animal. I no longer have the tools to get to them to test them. By posting this I'm about to jinx myself for sure. At 230,000 fun filled miles on my gal I still keep a clean car inside and out and under the hood too. A few days ago I wanted to track down an antifreeze leak by the reservoir. But before I got into that project I wanted to give the engine compartment a good rinse. My product of choice to cut road dirt and grime is full strength Simple Green from a spray bottle. I saturated everything and let it sit for a few minutes. To rinse, I used a garden hose without the sprayer attachment. Just my thumb over the end of the hose to give enough pressure to rinse off the Simple Green and grime. As God as my witness when I started the car to move her to a drier spot to attack the antifreeze leak the RP light wasn't on. No big deal I thought, it has been an intermittent problem from the start. Fixed the leak and took me chariot for a test drive....Still no RP code. By ​​​​​the end of my travels that day I logged about 100 miles on her. A combo of city and Interstate miles. Still no RP code. The next day, about another 100 miles...an still no RP code. This is the end of day three. Still no code and she's running fantastic. For the Love of all things Holy, I have no idea why the RP issue is gone. But for now, I'm one thankful piece of flesh. Your 2003 XJR is an X308 rather than an X350, so I've moved your thread to the X308 forum. Since your RP has been intermittent, it may not be gone for good. JagV8's suspicion of your battery is good - you can't tell its condition just by checking that the cables are clean and tight. Most auto parts stores will load test it for free, though their analyzers vary in sophistication. Low battery voltage can cause many spurious diagnostic trouble codes (DTCs) to be flagged. It is highly unlikely that a leaking camshaft (valve) cover gasket could cause your Restricted Performance or the DTCs you scanned, with the possible exception of the P0328, if oil has leaked onto the knock sensors. 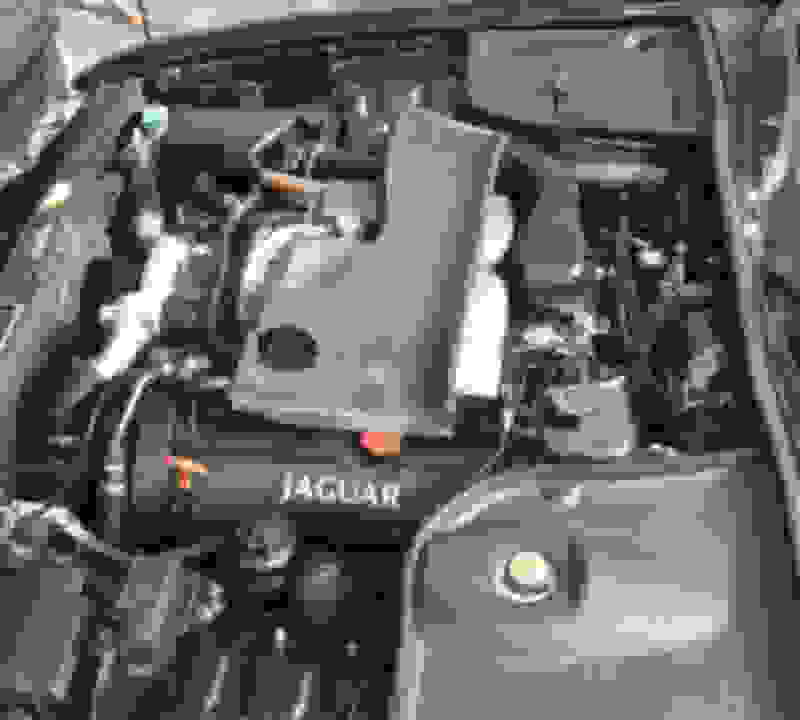 Also be aware that in addition to the Powertrain (P-prefix) codes that generic OBDII scan tools can read, your car probably also has stored Network (U-prefix) DTCs and possibly Chassis (C-prefix) and Body (B-prefix) DTCs that can only be read by Jaguar-dealer-level tools or high-end third-party tools. P1601 does not show up in any of my X308 or X350 Diagnostic Trouble Codes Summaries manuals, so that may be a fluke. I'm attaching one of the more complete manuals for you. Last edited by Don B; 02-11-2019 at 11:12 PM. Thank you for your reply and Attachment. I scrolled through the attachment and was blown away at all the little idiosyncrasies that can cause our cars to go bonkers. Boy do I miss the days of slapping on a new set of points, condenser, rotor cap, plugs, wires and off to the racetrack I'd go. Attached is an exterior pic of my car. She was built 11/2002 and has an XJR100 badge on the back. Even though she is not a full-blown XJR 100. ​​You can see she also has BBS wheels too. Once again, thank you for your knowledgeable reply and attachment. Last edited by XJRfan; 02-12-2019 at 05:24 AM. Reason: Found answer to my question. I think the 'move' failed Don; it's still here in 'X350' and it's not showing in 'X308' yet. Last edited by Partick the Cat; 02-12-2019 at 09:32 AM. "Check Engine" - "Engine Fault" - "Poor Vehicle Performance"
"Be you devils"?. "Nah,we are but SU"s"
This section is """not""" for technical advice!! My turn with P2135 - "engine system fault","dsc not available"," parking brake fault"
"cruise not available", "engine system fault", "gearbox fault"
Quick Reply: 2003 xjr "rp"